MANILA, Philippines — Philippine police killed at least 26 more drug and crime suspects in overnight gunbattles in the capital, bringing to 58 the death toll in a renewed bloody crackdown in the last three days that received praises from the president. 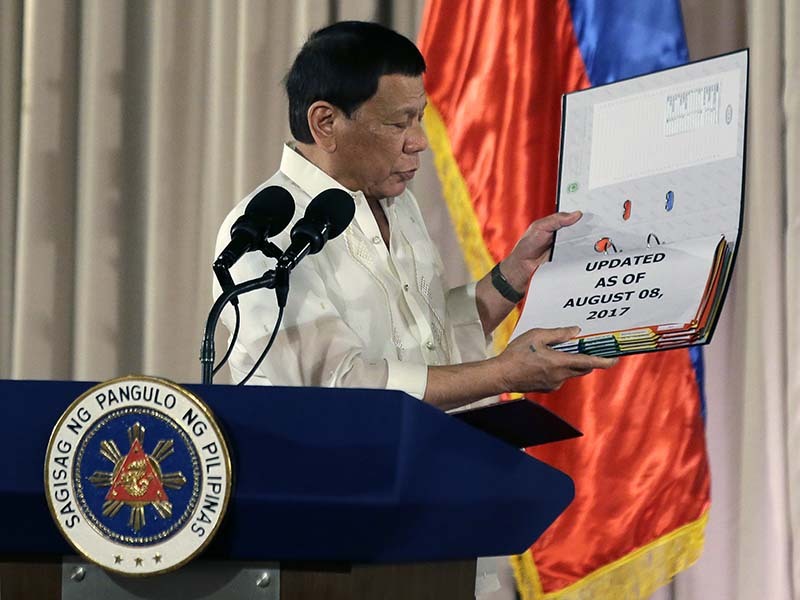 President Rodrigo Duterte expressed his satisfaction with the new spike in drug killings and reassured law enforcers Thursday they will not rot in jail if they get entangled in lawsuits. "If the police and the military get into trouble in connection with the performance of duty, you can expect, I really won't agree for you to be jailed," Duterte said to applause from police officers. While he acknowledged it may be tough for him to bring the drug menace under control during the rest of his six-year term, Duterte said the deadly crackdown would continue without letup. He announced rewards of 2 million pesos ($40,000) for each drug-linked police officer who would be killed. "You policemen who are into drugs ... the bounty I'm offering for your head is 2 million. No questions asked. I will not ask who killed you," Duterte told police officers in southern Ozamiz city. "I want you ... dead." Twenty-six drug and crime suspects were killed and more than 100 others arrested across the congested city in overnight police assaults, said Manila police Chief Superintendent Joel Napoleon Coronel. Officials played down suspicions the slain suspects were victims of extrajudicial killings. The deaths followed the killings of 32 suspects in separate police anti-drug raids Tuesday in Bulacan province north of Manila. The police operations took place under Duterte's notoriously bloody campaign that has horrified rights groups and sparked a complaint of mass murder against Duterte before the International Criminal Court. The complaint is pending. Police records show that since the nationwide crackdown started, more than 3,200 alleged drug offenders have been killed in gunbattles with law enforcers. More than 2,000 others died in drug-related killings, including attacks by motorcycle-riding masked gunmen and other assaults. Human rights groups report a higher toll and demand an independent investigation into Duterte's possible role in the violence. On Thursday, Duterte traveled under heavy security to congratulate officers in Ozamiz, where police fatally shot 15 people, including the city mayor, Reynaldo Parojinog Sr., who was among the politicians Duterte publicly linked to illegal drugs last year. Parojinog's wife and followers were killed in the July 30 fight that police said erupted when the mayor's men opened fire as they approached to search their houses. The mayor's daughter, who is the vice mayor, and several others were arrested. The Parojinogs have long denied allegations of their involvement in illegal drugs and firearms trade and keeping armed followers. The involvement of politicians, even judges and police, in illegal drugs underscores how the problem has spiraled out of control, Duterte said. "Are we or are we not a narcotic country? Yes we are," he said. Duterte also expressed disgust over an unfolding scandal when a huge amount of illegal drugs shipped from China slipped past the country's ports. Senators are investigating officials of the Bureau of Customs, who Duterte has described as "corrupt to the core." "So how can I finish it?" Duterte asked, referring to the drug problem and adding that even the U.S. couldn't eradicate illegal drugs. "If America can't do it, much more the Philippines now."